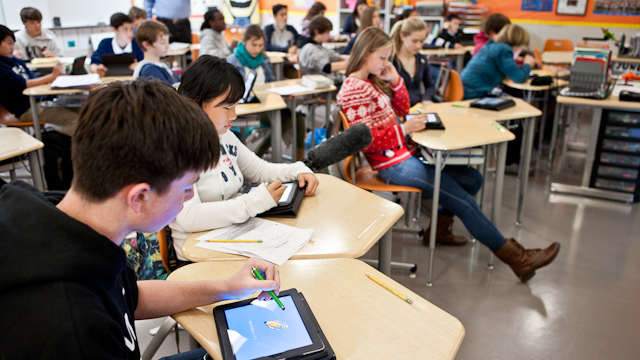 Just a few years ago, mobile devices were almost unheard of in classrooms. Over time, teachers and administrators have been experimenting with how to make mobile devices into powerful learning tools, and have come up with some strategies. A group of administrators from some of the first districts to pioneer Bring Your Own Device (BYOD) policies and other forms of mobile learning are now sharing their experiences with those hustling to get on board. The Consortium of School Networking, a professional group for district leaders, is trying to make that knowledge more widely available through its Mobile Learning Initiative. “It’s a way to keep up with what are the new burning questions, find out what leading people are doing, give a variety of insights into that particular topic so you can get a little bit of context and understanding,” said Marie Bjerede the initiative’s project director. The site offers insights into some of the key steps to implementing a strong mobile learning program and provides quick answers to real world problems that busy administrators may have as they roll out their own programs. 1. Set goals and expectations for teaching and learning with mobile devices before worrying about the device itself. “If this is a device plan and not a learning plan, you are definitely going down a path that could lead to some confusion and failed deployments,” said Michelle Bourgeois, technology coordinator at St. Vrain Valley School District in Colorado, and every administrator echoed this sentiment. "It's no longer just something you implement; it's evolving and it's unique in each location." Beginning a new initiative with the support and energy of teachers will also help the program to go more smoothly. Administrators who’ve been through the roll-out process before also recommend a pilot program to help identify problems, areas of professional development that are most needed and to begin developing some best practices to share with a larger group of teachers. 2. Develop a strong community of support for the initiative early and keep up transparent communication with parents and community members throughout the process. “Long before we handed out the first device, we started a community awareness program in terms of what we were planning to do and why,” Smith said. District representatives held many community meetings where they explained why it would be important for students to come out of school fluent in technology use and with a collaborative set of skills different from what parents were expected to have. By describing a vision for what students would be able to do after leaving school, Smith gradually won over parents. The strong vision for how mobile learning can change teaching and learning was the core of the communication between district officials and the community. Getting everyone on board with the ultimate goal helped them deal with the inevitable bumps in rolling out the technology and learning to use it for learning. 3. Think about equity, but don’t let it stop forward motion. While some districts deal with more poverty than others, equity concerns are part of every school administrator’s job. Many districts that pioneered mobile learning programs did so because they wanted to offer more equal access to the benefits of anytime-anywhere access to knowledge that computers offer. "When you give every student a device, it levels that playing field, but there are still inequities,” Smith said. His district charges each student a $50 tech fee per year. A local education foundation has agreed to pay for families who can’t afford the fee, but about half of the families eligible for free and reduced price lunch still pay the fee because they recognize its importance for their children, Smith said. For many districts embracing a 24-7 mobile learning program, the toughest equity challenge is getting every student access to the internet at home. “We’ve been trying to build lots of partnerships,” Bourgeois said. Her district includes both urban and rural areas, each of which have access issues. The district has been mapping resources that already exist, convincing cities to extend their programs if they are offering free internet in downtown business districts, and making sure students and parents know how to save resources for offline use. "Most of our kids are bringing a device to school, so we’ve just been able to supplement what students bring in with school owned technology,” Clark said. His students go back and forth between school-owned devices and their own, depending on need and in case of battery failure or other technical difficulties. It’s become a very fluid process, he said. 4. Evaluate the effectiveness of a mobile learning initiative based on the goals set at the beginning of the rollout. It’s easy to use improved test scores as a measure of whether a mobile learning initiative has been successful, but school leaders recommend trying to evaluate the goals set forth in the original vision and to think about evaluation holistically. If one element of a district’s vision is to put more power to direct learning in the hands of students, test scores aren’t the most appropriate measure of that goal. “Everybody wants to look at test scores because that’s a measurable goal that everyone understands, but there are other things that you can use to evaluate success,” Smith said. His district is in the sixth year of implementation and has found that graduation rates, attendance rates and academic success are all up. Meanwhile discipline issues and dropout rates are down. “Is that all because of technology? Absolutely not, but it is certainly a contributing factor for being able to meet all students where they are,” he said. It’s also tempting to expect results immediately, but leaders recommended allowing three to four years for educators and parents to grow into the program before expecting to see its value. 5. Some of the biggest lessons learned include giving up control and trusting students. “A lot of our shifts are making sure we are not mandating any more than we have to and that we’re empowering as much as we can,” Bourgeois said. She found that once devices were in the hands of teachers and students there was far more potential for creativity and student empowerment than district officials had imagined. The district has been working to get out of the way of that generative energy. “One of the things I would do early is bring the students into the process because I think their insights are pretty powerful and sometimes surprising in the way they think about things,” Bourgeois said. If she could re-do her rollout she would have included students in the discussions long before devices were chosen or in classrooms. They are stakeholders in their own education, but often aren’t included in the decisions that will directly affect their daily instruction. “Over time you start to really focus in on what students are doing and learning with those devices and then where is the rigor of instruction and where is the authenticity of instructional tasks,” Clark said. He noted that it's natural for schools to worry about the technical aspects of a rollout, but the novelty of the devices wears off quickly and when it does the whole school community can become even more focused on how to use the devices to offer the best learning opportunities possible. While these mobile learning pioneers have seen some of the pitfalls and can help districts new to the game avoid the same stumbles, this space is changing quickly and every community’s needs will be different. The technology will change, students will surprise their teachers and the best advice to district leaders is to stay open to all the possibilities and allow students to take control of the tremendous learning opportunity that having a device at all times could offer them.